Salacious title, but true story. This data set represents d-amph serum concentrations as a function of time after taking a single dose 30mg of Adderall. I'm having a hard time figuring out how to limit the range of the shifted functions before I add them. Its been ages since I've worked with math software. I am aware of the pharmacokinetic limitations of this kind of model. The DA is using a a wildly unrealistic reference range based on a 1x daily dosage. I just need to rebut that point. She's really cute. My girlfriend, not the DA. Any help appreciated. Similar to previous answers, only I don't make the instantaneous absorption assumption since it isn't really necessary. 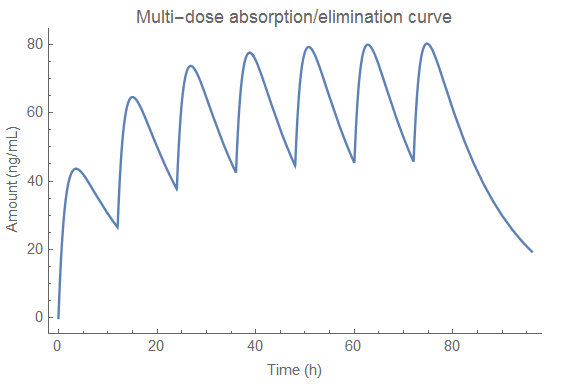 The equation can be found here on page three, where ka and ke are the rates of absorption and elimination, respectively, D is the initial dose (in ng), V/F is the Volume of Distribution. The range of apparent volumes of distribution I've seen for Adderall are from 271 (F = 0.92, V = 250 mL) to 485 mL. 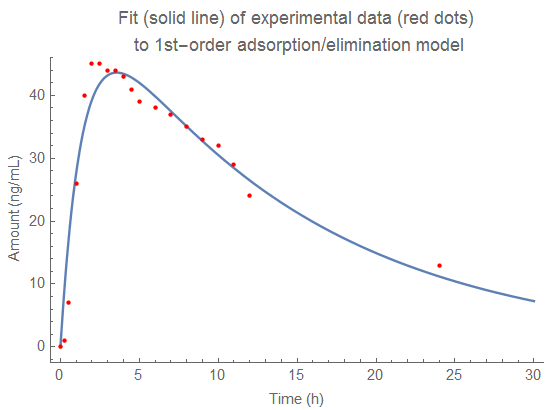 The previous references give estimates for the absorption rate constant of ~ 1/h and since the elimination rate must be much less than ka in order to get the observed concentration profile, we have parameter estimates of (d = 30000, v = 250, f = 0.92, ka = 1, ke = 0.1). I combine fd/v = const = 110 since the model cannot discriminate these values. 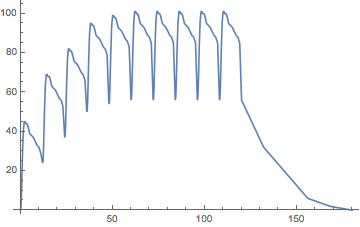 I'm assuming that the y axis in the original data is in ng/mL. Nonlinear model fitting with reasonable parameter estimates yields a reasonable fit, with ka = 0.72 h^-1, ke = 0.072 h^-1 and fd/v = 56. ke and fd/v appear to be highly correlated; however fixing fd/v to the range of literature values does not appear to change the best-fit parameter values beyond the range of the standard errors. I have no experience with what you are trying to do so this is entirely guesswork but maybe you want something like this? 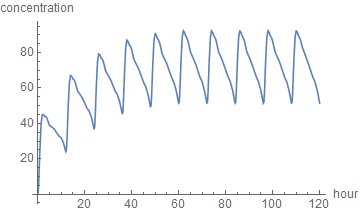 You can also do it with some timeseries arithmetic. Your problem, as stated, is insoluble for several reasons: methamphetamine is not a significant metabolite of amphetamine, and hence the data provided, which you refer to as indicating D-methamphetamine measurements at various times, cannot be informative as to the effects of the 30 mg Adderal you say your girlfriend had consumed. Adderal contains a mixture of amphetamine salts, none of which are methylated in vivo to a significant extent. Clearly, it's important to know which drug was taken and/or analyzed. If you could indicate the relevance you assign to the state's kinetic model being wrong, i.e. clarify the operative law here is, we can better address your question. For example: some states establish it as a criminal offense to have any amount of drug or metabolite in ones body while driving, even if completely unaffected (indeed, even if the substance isn't pharmacalogically active, it may still sustain a conviction- under such law the state's wild guesses probably aren't going to matter.) On the other hand, some states require a person to be impaired before they are criminally culpable, and yet others add a supplemental threshold concentration of drug which, if present, renders the driver impaired as a matter of law. Should you clear up the uncertainties which prevent your questions from being answered I'd be happy to do my best, my questionable qualifications notwithstanding, to nail down what was going on before the blood testing. Not the answer you're looking for? 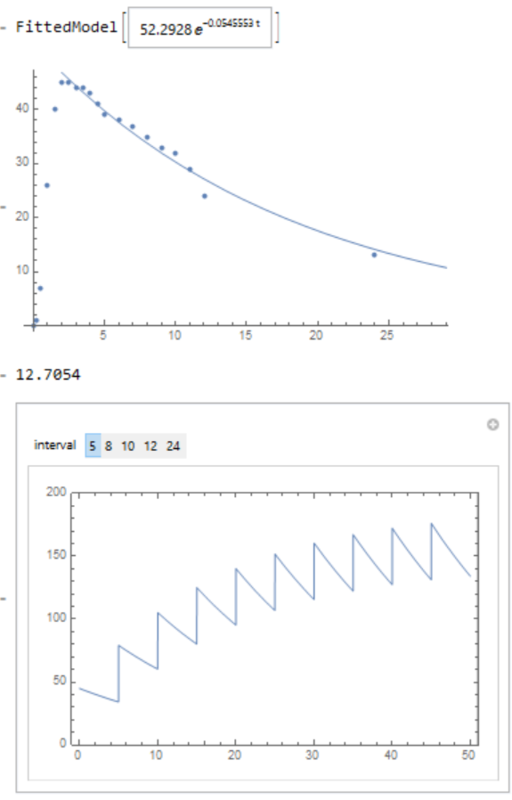 Browse other questions tagged plotting interpolation modeling or ask your own question. Interpolation impossible for ListPlot with Missing? What is going on in this plot? How to save plot along with legends as an image? How to approximate the data curve with a function?